The night between the 12th and the 13th of December has held a special place in Viking Age and Medieval Scandinavia. Our pre-Christian sources to this celebration are scarce, and we can only rely on folklore that survived until the present day and that we know was practiced at least by the 13th century – its attributes clearly stemming from far earlier, pagan times. Julereia – the Yule Riders – led by Lussi in some traditions, this was the night when the creatures of the other worlds would roam the night, and people ought to stay inside. This is the night when the month of Yule began. And it was also the most dangerous night of the year. A female spirit, a vette, ruled this night, going by the name of Lussi (“Light”). She was the mother and/or queen of the vettir (spirits) and other Huldrefolk (otherwordly beings), as such a kin to Huldra, gnomes, trolls, and at some time in history, even to the gods (hence her relation to the Ásgardsrei – the Riders from Ásgard, who in some traditions appeared on this night, while in other traditions they are called the Julereia – the Yule Riders). People had to stay inside this night, eating and celebrating to placate and avert the anger of Lussi´s retinue, and keeping the lights on. It was also very important to take care of the animals. 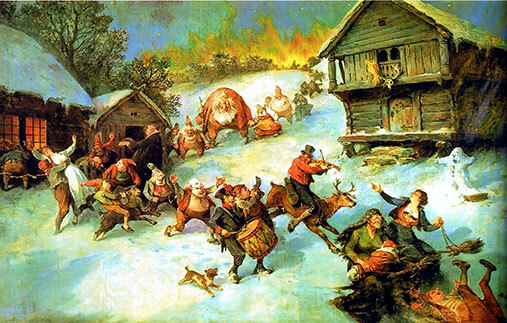 Julereia (the Yule Riders) by Niels Bergslien. Lussi was the mother and queen of the otherworldly creatures that roamed the Long (dark) Night of Light. This was also the night of the year in which the animals would talk to each other and let pass their verdicts on how their humans treated them – and woe to the people who did not treat their animals well – vengeance would then come from Lussi and her retinue of dark winter spirits! So the barn and the stable had to be clean and comfy for the beasts, and they would be bribed with particularly good food this night, in the hopes that they would give a favorable report to Lussi. The animals would discuss all the year´s events and pass on all the gossip that they had witnessed. This was thought to be the longest night of the year, hence the term “langnatt” (Long Night). And apart from brewing the beer and the ale and the mead, feeding the animals well and keeping the houses clean, and having finished with the year´s spinning, the most important cakes had to be made; the Lussi-cats (a term indicating a link between Lussi and the goddess Freyia?). 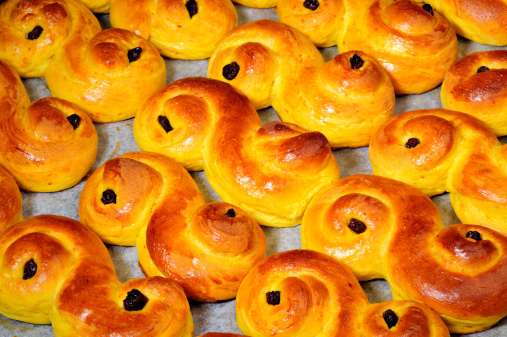 The Lussi-cats (Lussekatter) are baked with sapphron (although you may use turmeric), an imported spice that gives a yellow color, symbolizing gold, sun and light, all associated with both Freyia and Lussi. They must be formed like two spirals, and a raisin or other dry fruit would serve to give the impression of cat´s eyes, sight in the dark. These are ancient symbols of the sun reaching back to the Nordic Bronze Age. It was important to have these cakes ready for Lussi, although they were eaten in her honor by all the people of the farm, including the lowest. 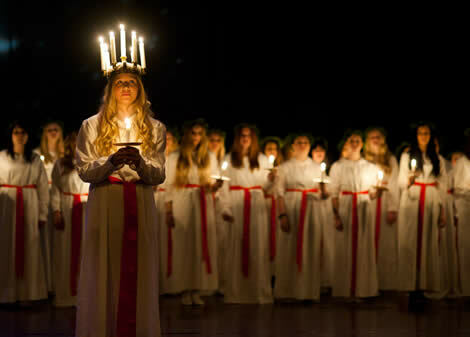 As soon as the Scandinavian countries had taken to Christianity, Lussi Long-Night became the celebration of a Roman saint, Lucia (also meaning “light”). The celebration would take the form of a procession led by a young maiden carrying a crown with four candles, singing “Santa Lucia”. She symbolizes the bringer of light in the dark. To what degree this celebration took a new form or is directly copied from pagan ritual processions is not known, but it is widespread; particularly in Scandinavia and in Italy, and in the Nordic primstav, a wooden runic calendar, her celebration was always marked.